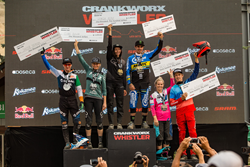 Monster Energy congratulates Sam Hill on his victory in the Garbanzo Downhill (DH) at Crankworx Whistler. The original King of Garbanzo made a return this week. Five time downhill world champion and defending Enduro World Series Champion Hill (AUS) blew the cobwebs off the big bike this weekend and made a triumphant return to the downhill circuit winning gold at the Crankworx MTB festival in Whistler, Canada. Despite the fact that Hill made the switch to full-time enduro racer and currently leads the Enduro World Series, he proved he is still a force to be reckoned with on a downhill bike. Billed as one of the longest downhill races in the world, the Garbanzo DH drops riders from the top of the Whistler bike park at 5528’. Riders must endure a lung busting 12 and a half minute run through some of the roughest, most technical terrain the bike park has to offer, including the infamous crack and root drops of “In Deep” and “Original Sin”. Hill has won this event numerous times over the last 10 years, before switching his focus to Enduro for the last two seasons. Seeing the champ on a big bike turned a lot of heads, as did his usual creative line choice and flat pedal drifts. “I haven’t enjoyed the downhill bike as I’ve been trying to get the hang of it again,” said Hill. “It’s a whole different animal to try and ride and tame if you aren’t used to it. I definitely felt a lot better during my race run after we made a few changes after practice. I had a pretty smooth run and tried to keep momentum to the bottom. My legs and arms are still sore from the EWS on Sunday but I tried to do my best” Hill laughed after the event. When asked if fans could expect to see him in any more Crankworx downhill events this year, he just smiled and said he would see what his team manager has signed him up for. For more on Hill and the rest of the Monster Energy team visit monsterenergy.com, and make sure to follow Monster Energy’s Facebook, Instagram & Twitter for exclusive updates.